Originally, we were due to attend a christening on Sunday, but having heard that the Little Chap’s Great Grandma (91) was not very well, we took the decision to send our apologies and make a flying visit to Yorkshire so that we could enjoy some time with her before her condition deteriorates further. Before visiting her, we had time to pop in to York, where we celebrated with a visit to one of English Heritage’s castles – Clifford’s Tower. There we played hunt the missing Kings and Queens and perhaps taught the Little Chap a little about the history of his nation in the process – well, you never know what might stick. That day, the City of York was treated to the bells of the Minster ringing out for her Majesty – they’d been ringing since 9.30 am and were still ringing when we left at 3 pm. Just after lunch, we were wandering past the Minster itself, only to be treated to a fly past of a Lancaster bomber and a couple of Spitfires – magnificent stuff – and a little unexpected taste of her Majesty’s own fly past in London today. Sunday was mostly about seeing Great Grandma and Mayfair Dad’s family before we made our way down the rain-soaked A1 (all the way!) back to London. We did manage to catch the highlights of the River Pageant on the TV before going to bed. I have to admit to being quite impressed – not just with the great show put on but also the stalwart nature of our monarch and her family, especially the Duke of Edinburgh, who all stood throughout the proceedings despite the cold and the rain – as did so many celebrants on the banks of the Thames. Yesterday was Street Party day – we didn’t have one in our street, but my parents live in the same street we did when we celebrated the Silver Jubilee in 1977. Yesterday all their children and grandchildren joined them for another to celebrate the Diamond Jubilee – as was the case for a couple of longstanding neighbours whose daughters I used to play with as a child. It was a surreal moment as thirty-five years dropped away and I caught up with childhood playmates I had long since lost touch with, while watching our little ones racing about as we had at similar ages in red, white and blue jubilee apparel. It was another very British affair with bunting, the national anthem, and a right royal picnic made up of everyone’s contributions from my mum’s coronation chicken to cupcakes, sausage rolls and one lady’s jubilee cake depicting the street itself! Then it was home for the Jubilee Concert on the television – our own private front row seats for Robbie, Jessie et al. The highlight for me was Madness on the roof of the palace, transforming it into “Our House” with visual lighting shenanigans and of course, the Military Wives Choir and co singing Gary Barlow’s tribute song “Sing”. I followed it simultaneously on Twitter, being amused by some of the tongue in cheek comments and moved by the shows of patriotism and very real pro-Royal sentiment. Then we cut our own Jubilee cake, which I whipped up pre-street party. Today we indulged in quieter pastimes and a few household chores, interspersed with the BBC’s coverage of the Thanksgiving service at St Paul’s and (the best bit!) the Queen’s procession from Westminster Hall to Buckingham Palace in the open Landau – despite the showers, she was still smiling! It was a real pleasure to witness such national pride, so often not seen, and so many thousands out in support on the streets today, not for a beautiful bride and a handsome young groom as last year at the Royal Wedding, but for our Queen, our constitutional monarch, our Head of State, the not particularly tall woman with the white hair who looks like no other granny in the world, being recognised wherever she goes, and who carried herself with no less grace, elegance and presence today than she did the day the nation crowned her as a young woman. An interview with Prince William today heard him say that she was the best example of how well women do at the top and how she has set the bar very high indeed. Here’s hoping that the other institutions in our country can do more to learn from her example and lead the way for the world to recruit more women to leadership positions in business and politics. I’d like to join the rest of the world and wish her a very happy Diamond Jubilee – congratulations ma’am and thank you. Long may she reign over us indeed. 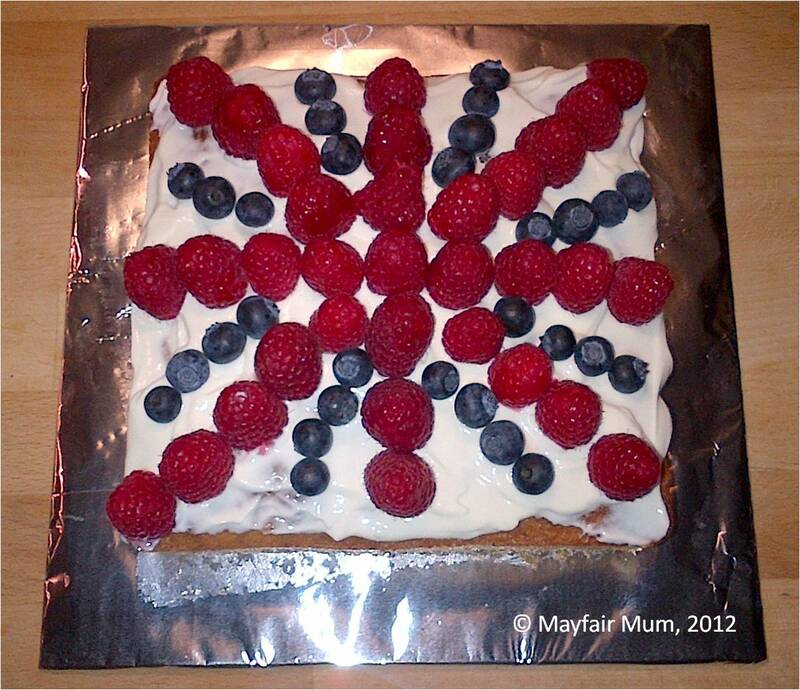 This entry was posted in Hyde Park Corner, Linky Love, Making & Baking, Parenting & Family and tagged BritMums, celebrations, diamond jubilee, jubilee manicure, memes, national pride, Queen Elizabeth II, victoria sponge cake, Vogue by Mayfair Mum. Bookmark the permalink. Love the post for so many reasons. A real feeling of family and Britishness. I used to live near Clifford’s Tower. I love your nails and the cake! I love your comment about the place of women in society too. You write so well too. Hi, I enjoyed reading this. It brought back memories for me as I used to live in York. We were on The Mall on Tuesday and a young girl standing next to us had done her nails like yours. 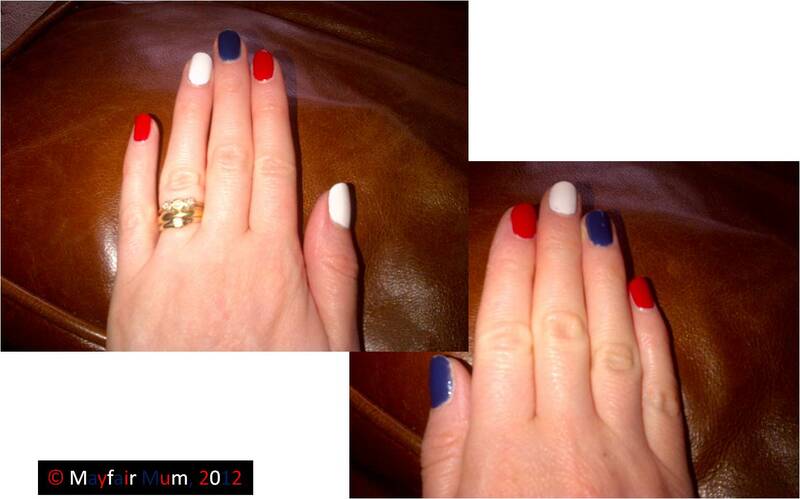 It’s great seeing all the different ways people manage to ‘red, white and blue’. Thanks for popping by – lucky you to have lived in York – why did you leave…?